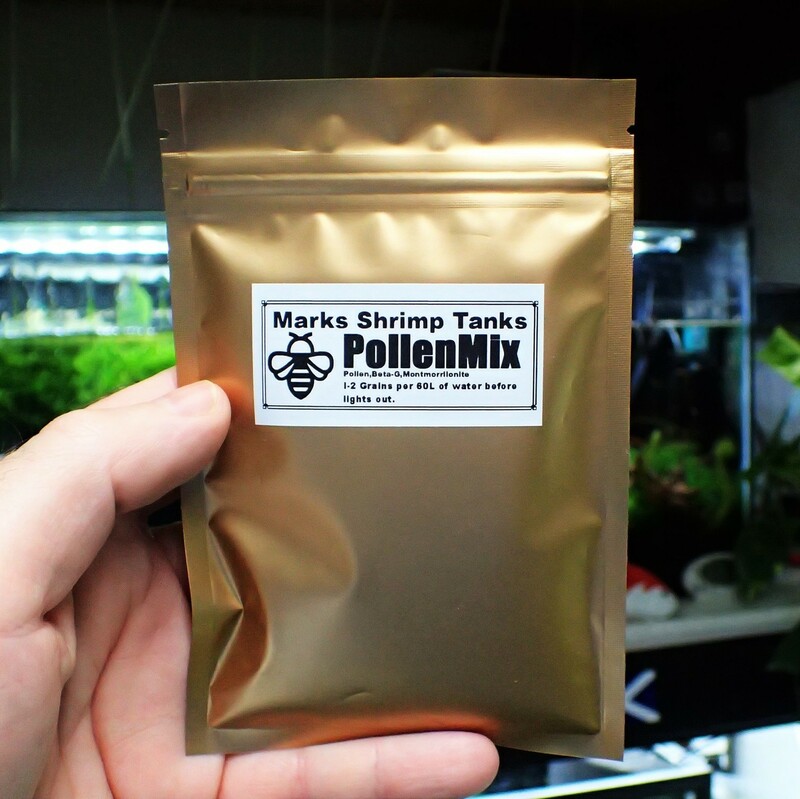 Bee pollen Shrimp Food contains all the nutrients needed to sustain life, it is being used on an ever larger scale for human nourishment and health, Bee-gathered pollens are rich in proteins, free amino acids, and vitamins, including B-complex and folic acid which make it the perfect food for a shrimp tank. The Bee Pollen granules on contact with water start to break up and disintegrate to form a fine trail of Bee Pollen. This is very important because young shrimp will often be very stationery for the first two weeks, I often dont even know I have baby shrimp until a young 3 week old shrimp wanders out of nowhere. So you can see the importance of getting food to every corner. Its also very important that you know I buy my pollen from a selected Bee Keeper and because of his destination ..what Is important to me when buying pollen is that you know where its from..do not buy any Pollen from places near built up areas or industrial places..you also want to avoid countries with heavy smog and pollution. Bees also collect pollen in a modest area of roughly 3 kilometers so you can also kind of know from what plants the pollen was collected..I know my pollen is collected in a mountainous region for example. Add a few grains at lights out because young shrimp tend to be slightly light sensative as they have no eyelids like we do, they also like to hide from predators, Bee Pollen is the perfect shrimp food for young shrimplet. I also add Beta Glucan to my Pollen as an immune system mobiliser, all this means is Beta Glucan makes your immune system work more efficiently and for shrimp this means more energy to spend on growth. Montmorillonite is added as a calcium source. Let me know what you think of this awesome Aquarium shrimp food.